I spent some time on rosemarywells.com, and found something that I felt needed to be posted. "Reading to your little one is just like putting gold coins in the bank. It will pay you back tenfold. Your daughter will learn, and imagine, and be strong in herself. Your son will thrive, and give your love back forever." Many of the readers of my blog are parents. This is a different audience than I first intended when I started writing. I thought teachers looking for lesson ideas would be my most popular group. I truly feel more and more parents are looking for creative ways to include reading into their weekly and daily routines. Parents see the impact that reading has on their children. I hope that the format of celebrating an author's birthday will help you find some new and exciting books to read your children. I hope that these blog posts familiarize you with some great authors so you can visit their section of the library and read as many books as you can. I hope that you need take a bigger bag to the library because your children want to check out more books than ever. This week we are celebrating Rosemary Wells' Birthday. I do hope you visit her new website, because it is one the best author websites that I have run across thus far. There are many great parts to this website including: videos and games, a parent and educators section where you can request resources, and a great online book store. It is always great to see authors understanding the value of providing additional resources to extend learning beyond the pages of their books. 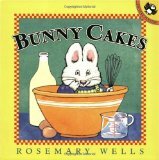 I was familiar with Rosemary Wells because of her famous characters Max and Ruby. Somehow we acquired a couple of Max and Ruby books, Bunny Cakes and Bunny Money . My daughter loved reading these books over and over for about a month when she was 3. Additionally, we have caught the Max and Ruby show on Nick Jr. quite a few times. I went to the library this week looking for something different than Max and Ruby. I found The Gulps and I ended up having to read multiple times at bed time. This book is illustrated by Marc Brown and therefore characters seem very familiar. This book is about a family of 5 that sets out on vacation in their large family traveling vehicle. However, the trip doesn't go very far because of a quick stop at a fast food joint and vehicle troubles. The vehicle troubles come from the fact that 4 out of the 5 members of the family are largely over weight and have stressed out the vehicle. A farmer that lives nearby where the vehicle breaks down invites the family to his farm where they are exposed to fresh food and hard work. This experience at the farm along with the encouragement of Dawn, the one child that exhibited healthy behavior all along, leads to the family changing their lifestyle for the better. At our house we are always talking about healthy choices. My 4 year daughter was able understand the meaning of this book and helped illustrate the importance of of our family mantra of "healthy choices". I haven't written about nursery rhymes in the past blog posts. There are many that believe that nursery rhymes help with early literary skills and build a great foundation for reading success. The Children's Reading Foundation states that children ideally should be able to recite 6-10 nursery rhymes before entering Kindergarten. Rosemary Wells has illustrated a couple of books that are packed full of nursery rhymes. The first book is My Very First Mother Goose . It has a sequel called Here Comes Mother Goose . Both books have Wells' familiar artwork that correlate well with the rhymes. Enjoy spending lots of time reading to your kids this week! A Visit with Rosemary Wells from Weston Woods on Vimeo.